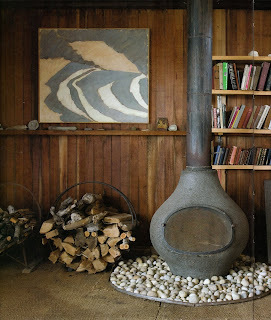 A few years ago I came across the Hatch House in Wellfleet. 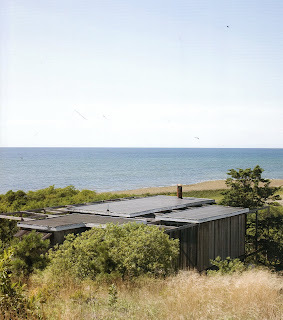 It's a modernist wood shack in the scrubby hills next to the bay beach on Cape Cod, designed in 1960 by Jack Hall for Robert and Ruth Hatch, as a summer beach home. Robert Hatch was a film critic and editor for The Nation magazine, and Ruth Hatch was an artist whose work was inspired by the landscape of the Cape. 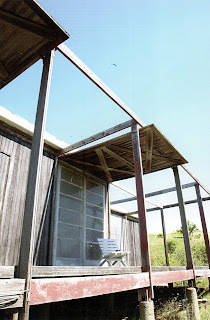 Above: In this photo the panels that protect the house in the winter are in the raised position, providing shade in the summer. You can just see the doors that lead into the main rooms. The pure lines of the house have stayed with me, and I went back in June to take another look when I was visiting family nearby. I'm happy to say that this house is the next project to be restored by the Cape Cod Modern House Trust. They've recently completed a restoration of the Kugel/Gips House, designed by architect Charles Zehnder. The Kugel/Gips project is the first to be made available to stay in...it's being offered at higher levels of membership for a week or two. There are some excellent photos of it here. 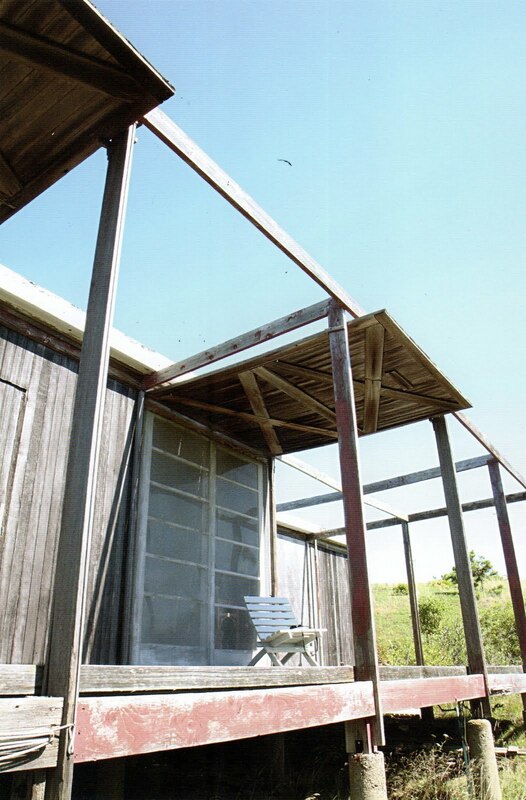 Above: In this photo the panels are down, protecting the house from storms and trespassers. 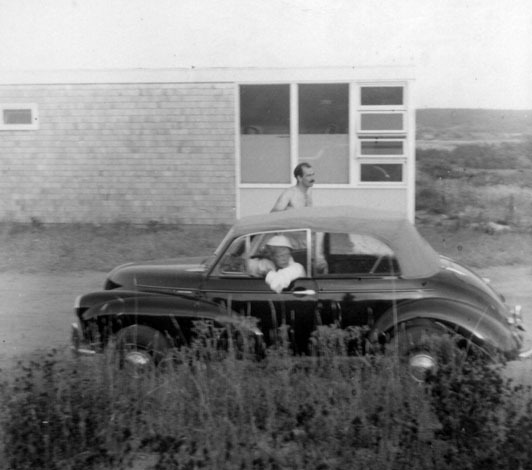 Above: This is Jack Hall, the architect of the Hatch House, with his wife, in 1952. Because of the old Rolls Royce he drove on the dirt roads of Wellfleet he was called the Squire of Bound Brook...the road he lived on. This photo, and the other vintage photos, are courtesy of Noa Hall, his daughter. Above: The same corner as the previous photo, 2011. Above: From the entry, you can see into the exterior space between the blocks of rooms. 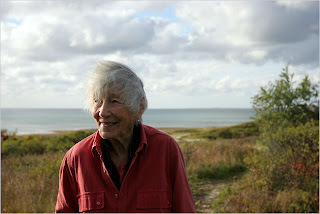 Above: Beach stones collected by Ruth Hatch. Above: Here you can see the Living Room windows and door at the far end of the walkway, and the Kitchen door at the near end. Above: After Ruth Hatch passed away in 2007, the house was cleared out and it reverted to the National Park Service, as it sits on protected land. 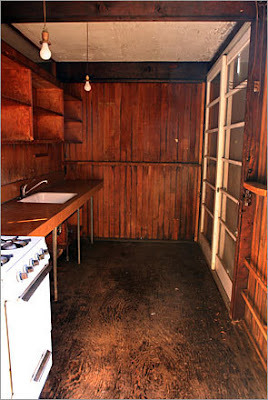 The photos of the empty house are from a piece in the Boston Globe. 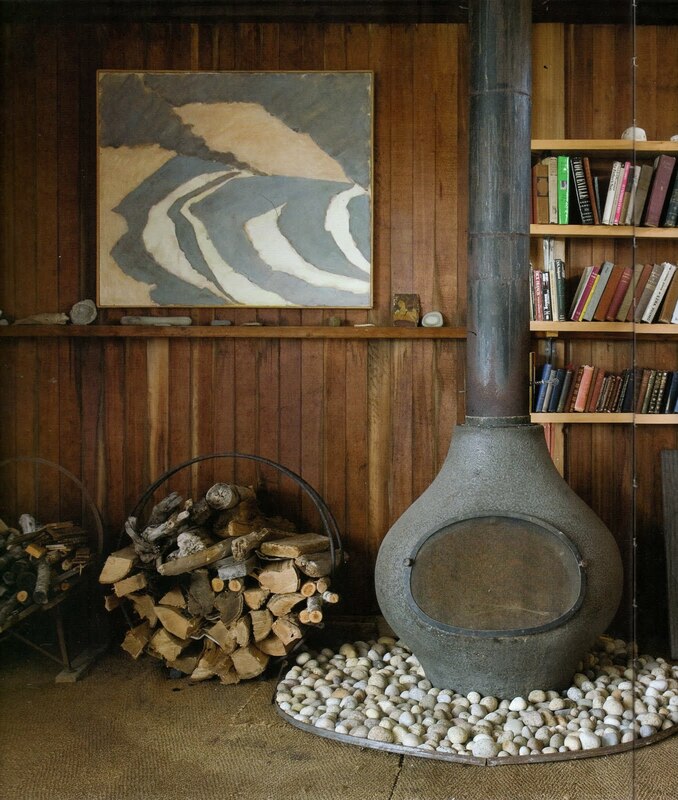 Above: A photo of Ruth Hatch, who summered here until the end of her long life, an age when most people would have been nervous about the rustic surroundings. Above: I'm really grateful for this wonderful book, Artists' Handmade Houses, which provided photos of the interior of the Hatch House as it was when Ruth Hatch lived there. 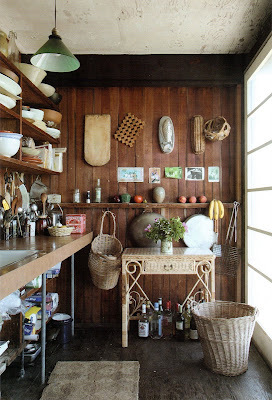 There are more excellent pictures both interior and exterior...find a copy and take a look. Lots of other fantastic homes in it as well. Above: The fireplace in the Living Room. Above: In the Living Room, just to the right of the previous photo. You can see the transom panels raised to create a breeze. Above: The Kitchen as it is now. 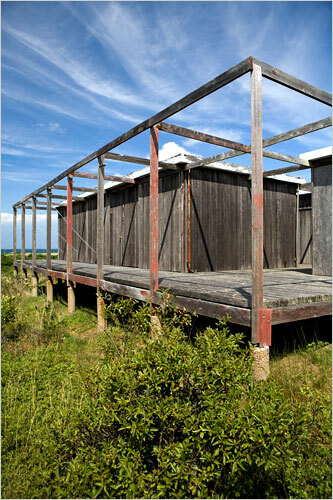 Above: A model of the house made by Ben Stracco, as part of an exhibition at The Provincetown Art Museum, "Chain of Events: Modern Architecture on the Outer Cape", in August of 2006. This exhibit, curated by Bob Bailey and Peter McMahon, is about the group of Modernist architects and their commissions built on the cape from the 1930's to the 1970's. The show seems to have created a chain of events of it's own. 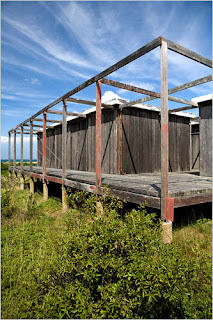 The increased awareness of these structures, many of which were falling apart from mold, rot, and so forth, has brought attention to the Cape Cod Modern House Trust (started by architect Peter McMahon) which has begun the work needed to restore them. Above: From a piece in the NY Times, August 2009. Above: A recent detail of a transom panel. You can see a great deal of restoration will be required to save this house. Above: The exterior walkway between the blocks of rooms. Above: The vintage photos taken by Jack Hall are courtesy of Noa Hall and the CCMHT. Above: The landscape around the Hatch House. Above: This sign made me think the house it marked was designed by Eero Saarinen, but actually it is the name of the owner, Lilly Saarinen, the architect's ex-wife. 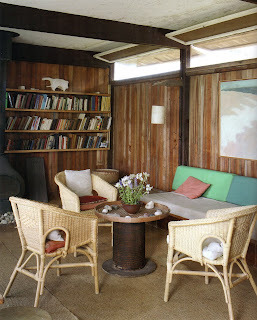 It was designed by a colleague of Saarinen's, Olav Hammarstrom, in 1960, for Lilly Saarinen and her children. 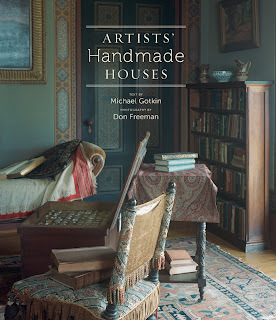 Hammarstrom designed many houses on the Cape. This one is located on a lovely kettle pond that you can see through the opening between the two structures when you arrive at the house. The modern building in these photos is actually appended to a traditional hunter's cabin that was on the property, which is mostly hidden when you're on the water side of the house. Above: The path to the pond. 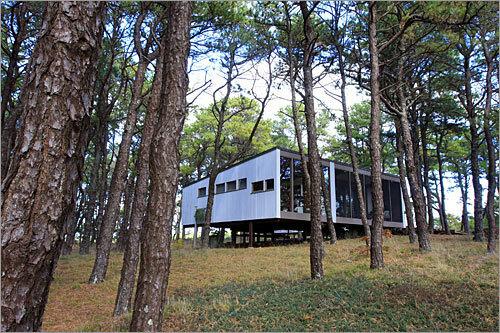 Above: The house is built along one of the many kettle ponds in Wellfleet. Above: My husbands sketchbook...from one of the Wellfleet ponds. Above: Photos taken this summer on one of the ponds. Above: This time the name on the sign, Breuer, does not mislead. 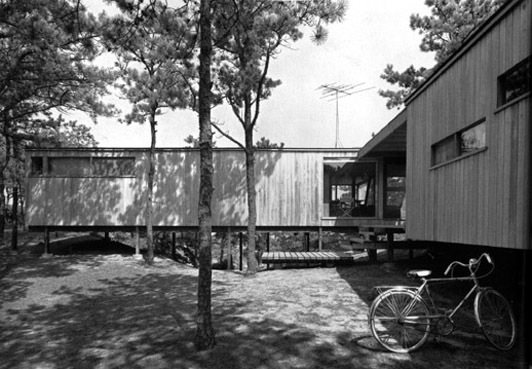 Marcel Breuer, who designed the Whitney Museum, imagined a group of cottages based on a prototype he'd designed in the early 1940's. 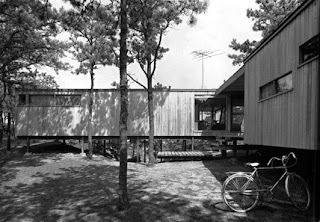 In 1948/49 he and a close friend, Gyorgy Kepes both had the protoype cottages built near each other. The contractor made them a deal, as they were being built at the same time, and they were almost the same...he'd build both of them for $5,000. Above: The house is made up of two structures, horizontal planes floating on a sloping site which leads down to another pond. Above: When you peer inside you can see full height windows open to the water. Above: The wood is being enveloped in moss. Above: The back of the long structure from the previous photo. 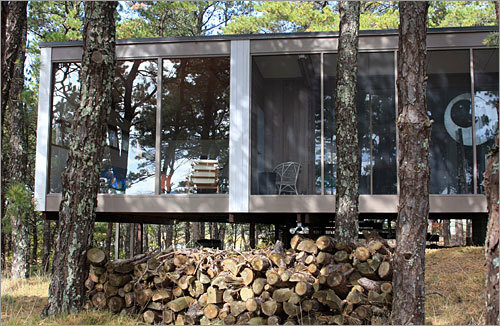 Above: The Dining Room is a cantilevered screened porch. The table is a piece of wood resting on cement blocks. Above: From the deck between the two parts of the house you can see the pond. Above: Moss growing on the wood siding. Above: Breuer and family photographed in the house, for LIFE magazine. Above: The sketch of the original design concept as published in Interiors Magazine, 1945. 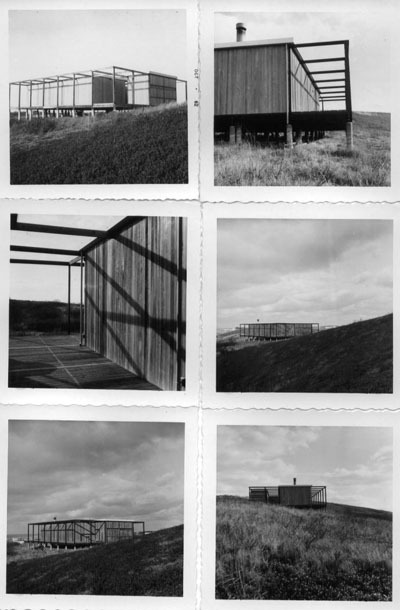 Above and below: These photos are of the Wise house, a mirror image of Breuer's own home, after the 1961 addition. This was commissioned by Harold and Barbara Wise in 1963. He was so busy at the time that using his existing design allowed the house to be built on a reasonable budget in a reasonable amount of time. 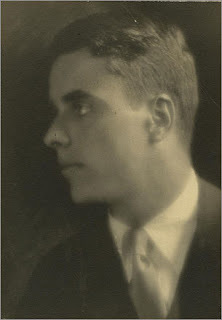 Above: A portrait of Jack Phillips. Surprisingly, he is the reason so many modernist architects settled into this part of Cape Cod. Born into a prominent Boston family, he chose a very different path than expected by his family. Having inherited 800 acres of oceanside woodland in the Wellfleet/Truro area from his uncle in the 1930s, Phillips moved full-time to Wellfleet with his wife and two daughters. He'd studied with Walter Gropius at Harvard for a year, and was enamoured with his work and the work of other European modernist architects. 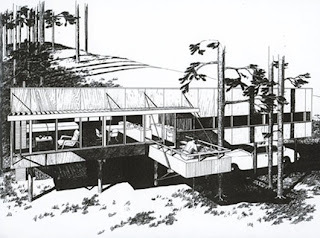 He envisioned an outpost of Modernist houses there on his land, and sold lots to such people as Marcel Breuer and Serge Chermayeff so that they'd come and build their experimental designs nearby, creating the community he'd imagined. 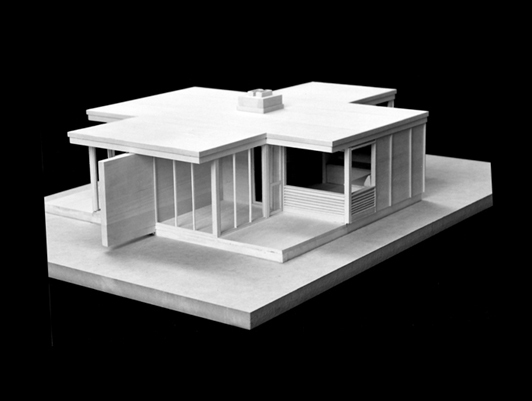 Above: A model of the basic cottage structure. The model was also built by Ben Stracco as a part of the "Chain of Events" show in 2006. Above: One of the guest cottages. 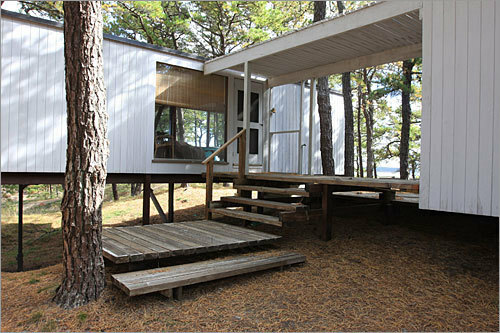 Above: The cottages are set in the woods with lots of privacy. They're just across the street from the bay. Now I know the Hatch house! I love the collection of old and new photos of it--what a treasure! Did the CCMHT say when they expect to complete their restoration? Thanks for all your research! Thank you! The CCMHT said they hoped to begin next year with the restoration. i was going to ask about the colony, and then saw you mentioned it. We stayed in wellfleet and my sister set up camp there so I had a chance to visit it. Brings back wonderful memories. lovely post! Thanks for sharing this. I really enjoyed reading your post. I can see why you took such an interest in the area. These treasures totally remind me of you and your family. So interesting. 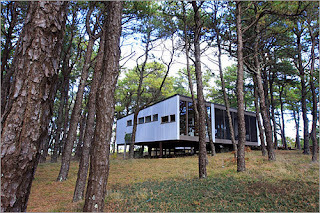 I had no idea of the modernist tradition on the Cape. I assumed all the buildings were "Cape Cod" style! Now I know there is another "Cape Cod" style. 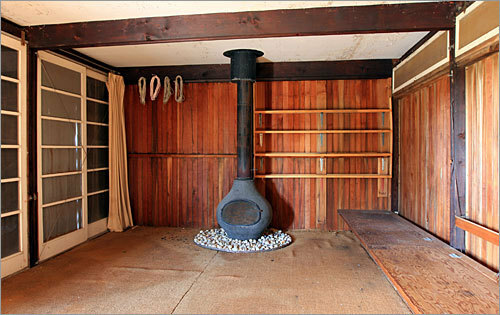 What I love is how reminiscent this house and many other modernist designs are of Japanese Zen gardens and the architecture of traditional tea houses, which employ seemingly paper thin shoji screens to both divide and open up the interior spaces to each other and to the outside. 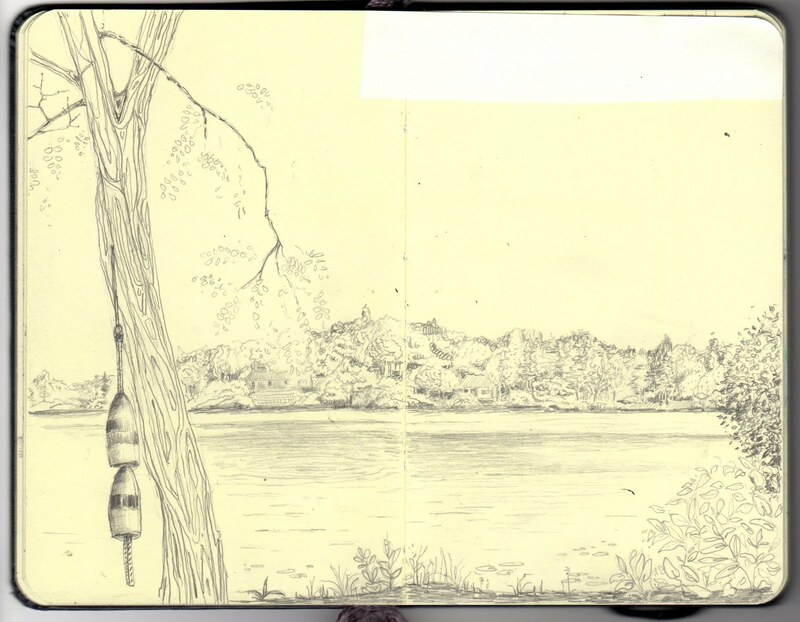 Focus is always drawn to the beauty of the materials and to that of Nature itself. Provocative.Thank you. Thank you for this. 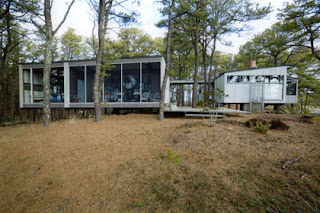 I've just been writing and thinking about the Cape and my friend Charlie Zhender and some things I found here: http://www.ccmht.org/architects.html I recognize some of the places and visit the Cape every year if I can.